An interesting read in the AUTRE journal about a previous Bjarne Melgaard exhibition. This article gives some brief notes on the subject matter of the show, which is also evident in our current Melgaard exhibition at the gallery. Entering Bjarne Melgaard’s solo exhibition, currently on view at Karma gallery in New York, means entering a psychologically charged space. After passing through the curtain of quilted and stuffed sausages, printed with Melgaard’s drawings, and past the obstacle course of penises in the hallway the viewer is confronted with a large wall curtain made out of prints, stuffed pillows, and string. The adjacent walls are covered with Melgaard’s paintings, which he did as a response to Karel Appel’s Psychopathological Notebook (1950). Appel created his notebook after visiting the L’Art Chez les Fous exhibit in Paris, the International Exhibition of Psychopathological Art at the Sainte- Anne psychiatric hospital. Dissatisfied with the pamphlet that accompanied the exhibition Appel decided to draw over the published text. 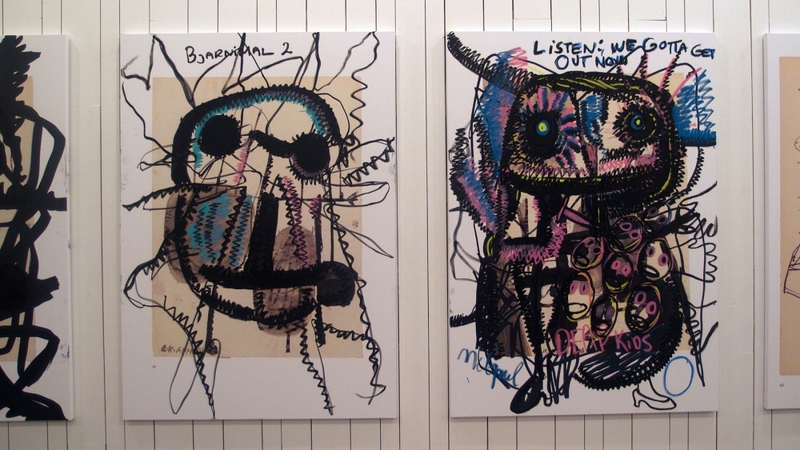 Melgaard’s paintings are the result of the artist’s own hand manipulating and covering Appel’s original drawings. The already highly expressive and charged drawings become further abstracted and frantic.